We are hearing information from different sources that AMD may have more serious issues with supplying enough of its Radeon RX 500 series of GPUs on the market for the next couple of months. 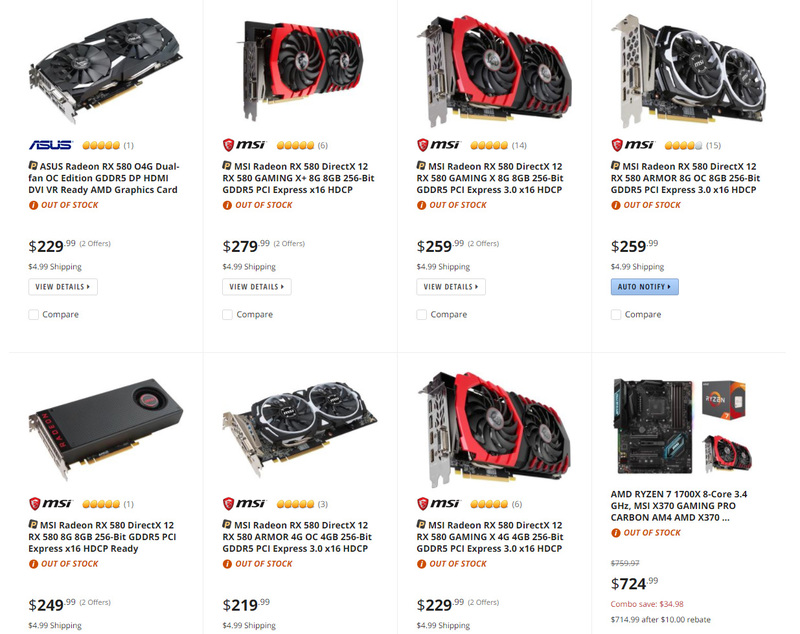 It is not all about the increased demand from crypto miners as it seems that that the company may be experiencing some other issues that are causing it to not be able to produce enough GPUs to cover the demand. Looking at Ethereum’s hashrate and difficulty data however does not yet show a significant slowdown in growth, but the reason for that could easily be the move of existing mining power from other crypto coins to ETH. Other more powerful GPUs from Nvidia are not so great for mining Ethereum due to the use of GDDR5X video memory instead of GDDR5 that is found on the GTX 1070. The GDDR5X memory is faster in terms of clock speed and offers more bandwidth, but apparently uses less aggressive timings and as a result is not much faster than the “slower” GDDR5 memory. As a result if you are looking at GTX 1080 or GTX 1080 Ti for Ethereum mining their price/performance ratio is really not attractive at all as far as Ethereum mining goes. Nvidia on the other hand is faster on ZEC and many other algorithms, but then again people are currently crazy about ETH. So do your math and think about it and don’t overthrow the GTX 1070 as a good option for Ethereum mining.